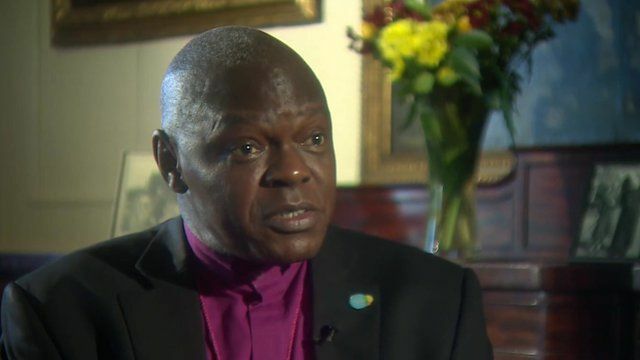 Sentamu appeal to Ebola-hit countries Jump to media player People of faith in countries struggling to combat the world's worst outbreak of Ebola should not meet in large numbers, the UK's Archbishop of York says. In numbers: Treating Ebola patients Jump to media player BBC News looks at what it takes to treat Ebola patients, in numbers and graphics. Ebola survivors’ blood 'saving lives' Jump to media player Blood from survivors of the Ebola virus is being used to treat patients suffering from the disease. Ebola: How to treat early stages Jump to media player The BBC's Will Ross in Nigeria speaks to Dr Simon Mardel, a global health adviser and expert on Ebola, on what to do if someone suspects they have Ebola. Training for safe Ebola burials Jump to media player The World Health Organisation says a treatment is being developed to tackle Ebola, in Sierra Leone burial safety exercises have been taking place. The quest for an Ebola vaccine Jump to media player Authorities in West Africa are struggling to deal with the Ebola outbreak which has already claimed thousands of lives in Sierra Leone, Liberia and Guinea. People of faith in countries struggling to combat the world's worst outbreak of Ebola should not meet in large numbers, the UK's Archbishop of York has said. Dr Sentamu welcomed action by Britain, sending soldiers and medical staff to affected countries, but said the EU and the rest of the world should do more to contain the outbreak. He spoke to the BBC's religious affairs correspondent Caroline Wyatt.